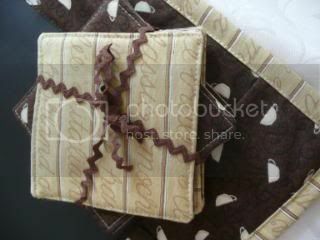 sewing the seeds of love: Mmmm..... coffee and chocolate.....Kitchen Swap !! Mmmm..... coffee and chocolate.....Kitchen Swap !! My partner Melissa received the little box of goodies for the Kitchen swap I sent her. Melissa mentioned her kitchen was brown and cream, so when I saw some cute coffee themed fabric in those exact colours , on one of my fabric shop adventures...I knew I had to get it! Apparently I chose well, Melissa and her husband both have a love of coffee!! 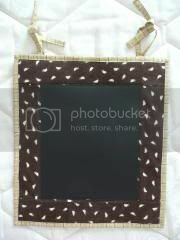 I made a set of coasters and a chalkboard fabric message board with the fabric. What goes so well with coffee? 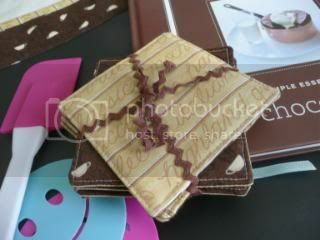 .. ...chocolate !! 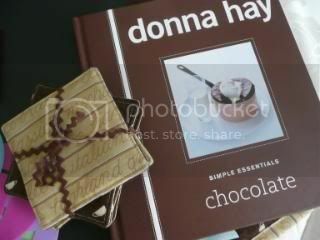 ..so I included a Donna Hay Chocolate Recipe book, a spatula to help make some yummy chocolate cakes...and some cute stencils to decorate cappucino or hot chocolates with ...place them over the cup and shake the sprinkles over !! Thankyou ,Melissa , for being my kitchen swap partner..it has been lots of fun ! !